Appliques of pretty fruit are embroidered on a pieced and quilted background. Then layers of fabric are tacked in place ready to turn into chenille. The frayed fabric makes the fruit appear three dimensional. 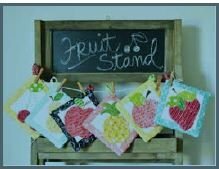 All six fruits come in five appealing sizes for functional use or kitchen decor.